You’ll receive this quest upon entering the Skull Cavern via the Skull Key. To do this you must first get to Calico Desert, via repairing the bus, and reach level 120 in the Mines, where the Skull Key is located. Once you actually enter the Cavern this quest will trigger automatically. Bring lots of healing items, preferably recipes that will restore your health to a greater degree. If you don’t have any good healing items you can find Cactus Fruits strewn about Calico Desert which do nicely in a pinch. You can also purchase Cactus Fruits and Ice Creams from Sandy’s Oasis in Calico Desert, though only on Tuesdays and Sundays, respectively. Have the best sword you can afford. You need the speed to deal with those flying serpent things. (Keep the sound on so you can hear them coming, for that matter.) The Lava Katana is the obvious preference. Bring Bombs. You’re inevitably going to run into floors full of Mummies, and you can’t destroy them for good without Bombs. Even if your intention is to run past most of them you’ll occasionally find it much safer to bomb them out of existence. 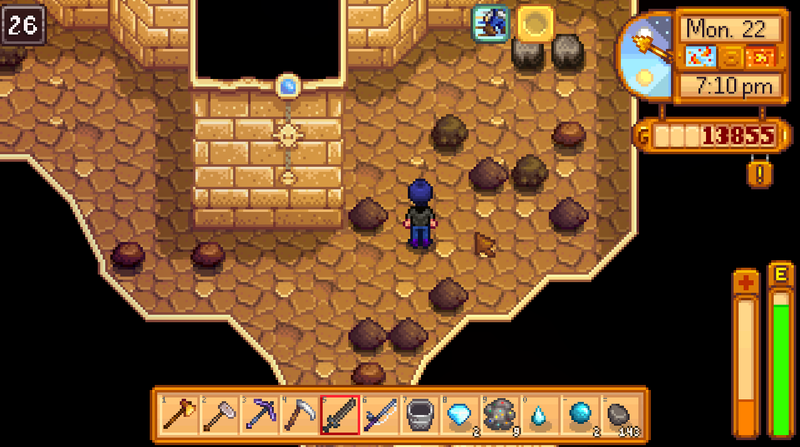 Start bashing rocks as soon as you arrive on a floor. Exit stairs tend to appear fairly close to the entrance in my experience. Use pits. Though you have no idea how far a pit will drop you or how much damage you may take, they’re by far the best way to get through Skull Cavern in a hurry. If you’re running out of health, boot it out of the Cavern. Don’t risk losing a bunch of items because you think you can survive one or two more levels. Better to err on the side of caution and not lose everything you found - and everything you brought along in the first place. Once you’ve reached at least level 25 you’ll complete the conditions of the quest. Head home and go to bed. You’ll find a letter in your mailbox the next day with 10,000 gold attached. Nice. -- five nights at freddy’s game.